Ciao Bella located at 1514 US Highway 41 in Schererville, Indiana offers true authentic Italian cuisine made with love and passion in a warm, refined atmosphere. 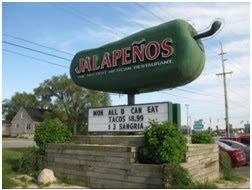 Jalapeno’s Restaurant, located at 200 US-41 in Schererville, Indiana, is committed to serving its guests with authentic and traditional Mexican dishes. Some of their classic Mexican foods include tamales, enchiladas, and fajitas. The food at Jalapeno’s restaurant compliments the memorable flavors from the stand in Mexico. They also have a family oriented and authentic atmosphere. Being in a Northwest Indiana neighborhood, they are able to offer affordable, yet traditional dishes including enchiladas, steak tacos and chilesrellenos, plus more ambitious fare like steak Milanesa and Camarones Al Mojo De Ajo. There are margaritas in fruity flavors like mango and strawberry, plus about 70 tequilas for those who prefer their agave solo. They serve only the finest meats and the freshest vegetables. They make their food from scratch using only the freshest ingredients available. They create their own recipes mixing old recipes and contemporary ones. They also offer seating on the patio that has an outside bar and waterfalls. Jalapeno’s also offers catering. For those who wish to stay after dinner for a fun evening, they offer karaoke, live music, and some of the areas top djs. On Friday nights the large dining room is transformed into Woodhollow Nightclub with live dj’s and dancing to the hottest hits of today. So if you just want to stop in for a margarita and some great food or make it an entire evening, Jalapenos has got you covered. Something that is kind of unique, if you write a google review for this restaurant, the owner responds to all of the comments. It doesn’t matter if the comment is good or bad, he will thank the customer, or he will apologize if someone was unhappy and make a suggestion. So, are you ready to go eat some authentic Mexican food? You can go to their website or give them a call to see their hours or hear about their current specials.